Does the flab on your arms keep waving after you’re done saying goodbye? Ever wonder what to do to get rid of arm fat? Total Gym arm workouts can help! 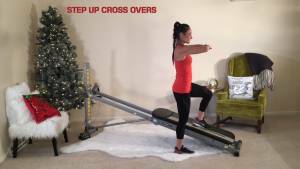 Although it’s impossible to reduce fat only in a targeted area, there are isolation exercises that can increase strength and tone of those muscles. For the shoulders and arms, dips work the triceps on the back of the upper arm, the anterior deltoid on the front of the shoulder and the pectoralis muscles on the chest. The rhomboids and lats, and some traps in the back are also activated during this Total Gym upper body workout. Triceps and shoulders are one of the most overlooked muscle groups in a workout routine, so these moves can be difficult. Dips can be performed in several stages so that as you build strength, you can progressively make this exercise more challenging. If you’re a beginner, start by placing your hands behind you on a bench and your feet on the floor; bend your legs 90 degrees at the hips and knees. Lower your body by bending your arms at the elbows until they form a 90-degree angle. Keep the elbows pressed in toward your ribs. Then extend the arms straight. In the next progression, place your feet on a bench the same height as the bench under your hands. Keep your legs straight and lower yourself toward the ground and then press back up. 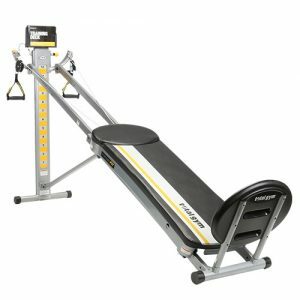 Intensify this exercise using the Dip Bar accessory on the Total Gym and gradually raising the incline level of the glideboard on the support column. The idea is to work against gravity. Once this is easy, then weight plates may be added via the use of a weight bar accessory. Remember to always press your back into the glideboard for complete support. There is a tendency for the elbows to flare out as you dip down, but try to concentrate on keeping them pinned to your ribs. This is actually easier to do when performing dips on parallel bars. 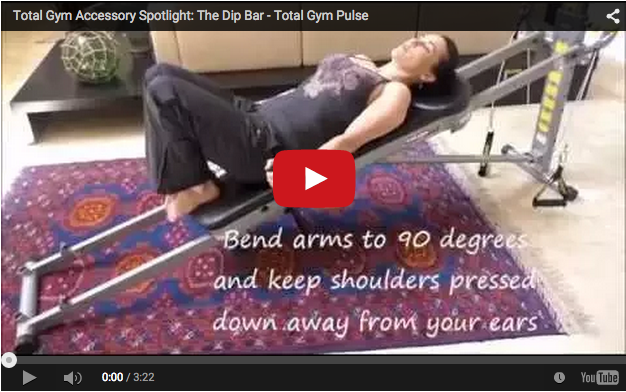 Incidentally, dips on parallel bars also allow you to work the pectoralis major and minor more deeply. However, the Total Gym is all you need for a complete upper body workout. Since dips are a pushing exercise, balance the posterior arm workout with a pulling exercise that incorporates more of the back and biceps. Lat pull-downs with the cables or pull-ups with the Wing attachment are good exercises to be done in conjunction with dips. You will see results in four to six weeks if you do these exercises in sets of three, three times a week. When the dips start to feel easy, increase resistance or do more reps (try pyramid reps). Just purchased a Total Gym Fusion. Will these dip bars fit my model? Hey Chris, when you select the Dip Bars on the website, it will ask you to select the gym you’re using them for. This will ensure we send you the right fitment of the dip bars! If you still have questions, let us know!